They had barely gathered in the basement before chaos erupted the night of June 3, 1980. "Pretty soon we could hear things crashing. It was almost like the whole house exploded above us," Florence Rozendal said. "Sheetrock fell on my head. ... There was so much of a sucking sensation. It was almost like you were in a vacuum." Rozendal, her husband, Harley, and the couple's three children survived Grand Island's most devastating storm nearly 16 years ago. Their story inspired a book, which has been made into a television movie. 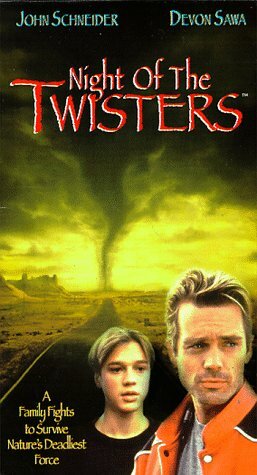 "Night of the Twisters" starring John Schneider will be shown at 6 p.m. Sunday on the Family Channel. The book by the same name was written by Hastings native Ivy Ruckman, Rozendal's first cousin and close friend. Rozendal's and Ruckman's mothers were sisters. Because Ruckman is a fiction writer, many events in her book do not mirror those in 1980, but some events are similar. Rozendal is eager to see how much the movie portrays of her family's own situation. "I'm sure it will be very eerie," she said. "I'm actually excited to watch it. Some of the things that actually are in the book happened to our family and surrounding neighbors." The Rozendals' youngest son, Ryan, was an infant at the time and is now a sophomore at Grand Island Senior High School. Mark, now 22, was 7, while their eldest daughter, Cindy (now Meyers), was 10. The family lost everything in the string of tornadoes that left five Grand Islanders dead and parts of the city in ruins. "We didn't have anything but the clothes that were on our backs. No shoes. We basically didn't have anything," Florence Rozendal said. "I think that was the miraculous thing about the whole storm, that there were not more lives lost."